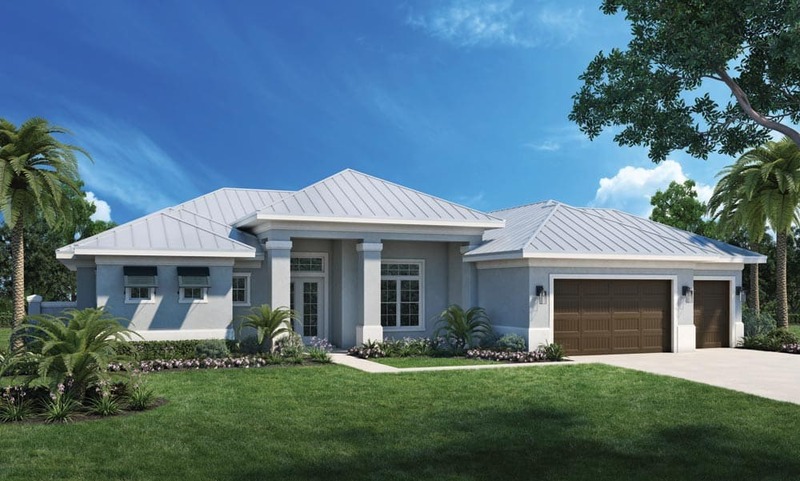 Luxury homebuilder Florida Lifestyle Homes has completed construction of the Key Largo, a new model at Naples Reserve, a 688-acre master-planned community off U.S 41, east of Collier Boulevard. The Key Largo is an open great room plan with three bedrooms plus a study, three full baths and a powder room in 3,045 air-conditioned square feet. With the outdoor living area, three-car garage and covered entry porch, the Key Largo encompasses 4,637 total square feet. Double doors opening to the foyer of the Key Largo leads to the great room and views through full-length windows to the pool and lake beyond. The 13-foot ceiling is accentuated by a multibeamed ceiling detail. The open-concept kitchen is crowned with its own ceiling feature and offers two islands, state-of-the-art appliances with a gas cooktop and a walk-in pantry. The adjacent dining area opens through pocketing glass doors onto the lanai, expanding entertaining space into the outdoor area. A private study is at the front of the home. Each of the three guest bedrooms offers a full bath and walk-in closet. Pocketing sliding glass doors provide access to the lanai from one of the guest bedrooms. The bath of that room may double as a pool bath while a pocketing door assures privacy to the bedroom. The covered lanai includes a complete outdoor living area with a full outdoor kitchen, creating an inviting space for casual outdoor entertaining. The master suite is secluded in one wing of the home, providing owners a quiet retreat. Set beneath a vaulted ceiling, the master bedroom opens to a private lanai. The suite includes two walk-in closets and a luxurious master bath with twin vanities, a soaking tub that is the centerpiece of the bath, a walk-through shower with multiple jets and a private water closet. The Key Largo includes numerous architectural embellishments and the attention to detail that is the trademark of Florida Lifestyle Homes. The Key Largo is priced at $1.395 million, with designer furnishings by Norris Home Furniture & Interiors included. The Key Largo is designed for the full enjoyment of outdoor spaces to provide a casual, yet elegant lifestyle in keeping with the natural ambiance of Naples Reserve. Amenities at Naples Reserve include the Island Club, a 5,160-square-foot clubhouse and an adjacent 3,500- square-foot fitness center with state-of-the-art equipment and a movement studio.